New for Fall 2016 are the Dainese D1 Rossi Replica Axial Pro Boots. Same premium protection and comfort as the original Dainese Axial Pro In Boots, now updated with slick Valentino Rossi style. 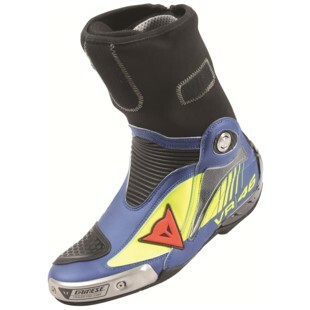 The Dainese Axial Pro In D1 Rossi Replica Boots offer a unique design, intended to specifically to integrate with Dainese race suits, these boots have an innovative upper that slides inside the leg of your suit and securely attaches with Velcro closures. This system creates a seamless transition from suit to boot that reduces risk of the boot catching on parts of the bike or road debris in the event of a crash. Also, the feature the signature style of the greatest MotoGP racer, well, possibly EVER! So that is pretty rad too. The Dainese Axial Pro In Boots are the result of years of research and development by MotoGP riders all over the world, and now with new Axial Pro In D1 Rossi Replica Boots you get the same winning asymmetrical color scheme and graphic worn by Rossi himself. The bells in Tavullia will ring every time you rock these boots! Tags: Axial Pro D1 Rossi Replica Boots, D1 Rossi Replica Boots, Dainese Axial Pro D1 Rossi Replica Boots, Dainese D1 Rossi Replica Axial Pro.